BBC Sport's Joe Wilson reports on Sir Ben Ainslie's attempts to put together Britain's first winning America's Cup team ahead of the 2017 event. 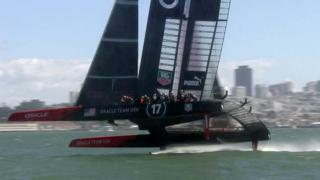 Ainslie won the race with Oracle Team USA last year when they overhauled an 8-1 deficit to beat Team New Zealand in San Francisco in 2013. A British team has never won the oldest trophy in international sport since it first took place off the Isle of Wight in England in 1851, and Ainslie says it would be an "incredible opportunity" in "righting a wrong" in British sport.